An azeotrope or azeotrope (Greek a-, " not," zeo " boiling " tropos " turn ," here meaning " change" ) is a string of two or more chemical compounds liquid whose vapor has the same composition as the liquid phase. The mixture has a constant boiling point and can not be separated by simple distillation; so it behaves like a pure substance. Azeotropism is the opposite of Zeotropie. 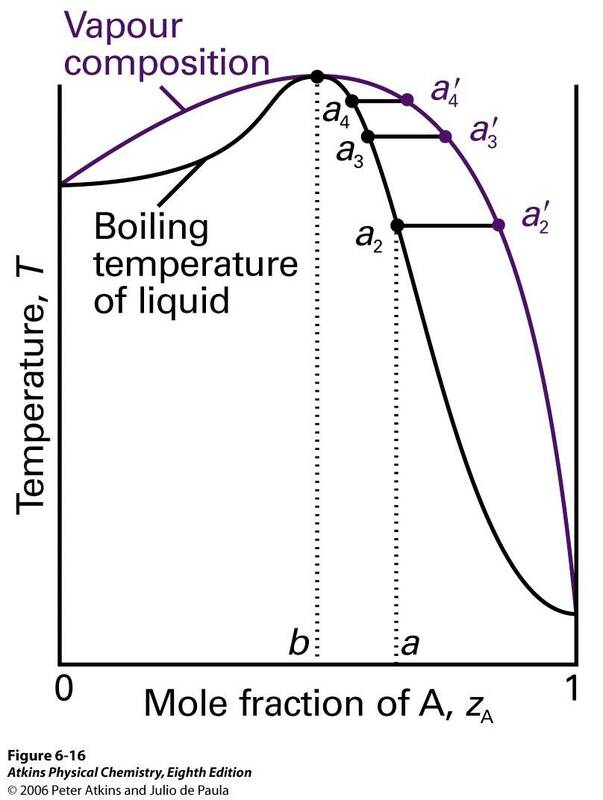 In azeotropic mixtures, the boiling and condensation curves of the components touch each other in px phase diagram in the azeotropic mixture ratio. In the xy - diagram, the x = y line cut ( see illustration). 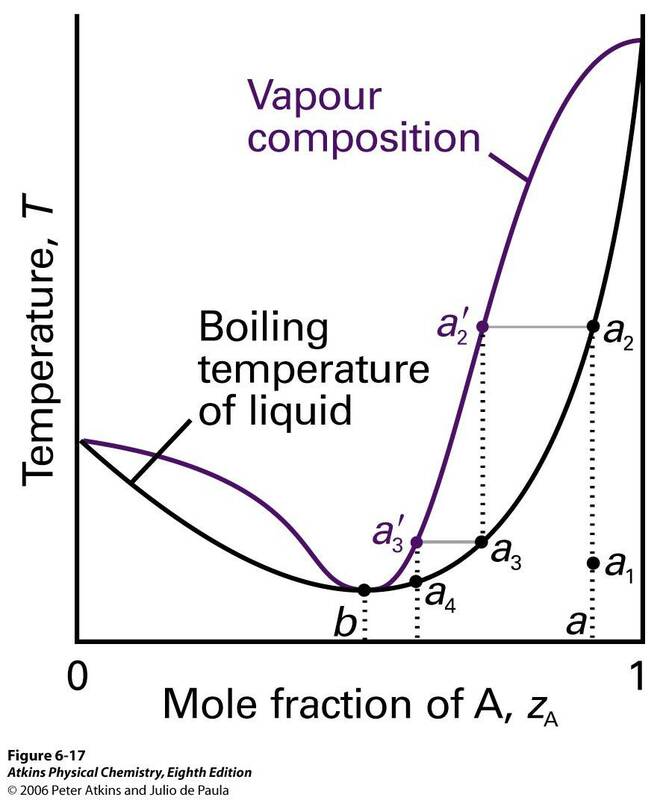 Azeotropes are formed when the partial vapor pressures of the components of a mixed liquid differ materially from those entailed for an ideal mix of Raoult's law vapor pressures. Two components (eg HCl/H2O ) which have strong interactions with each other than in the pure material, thereby forming an azeotrope with vapor pressure minimum / maximum boiling point; cohesion between HCl and H2O is H2O molecules between greater than or HCl molecules. Two components, such as ethanol and water, which have weaker interactions with each other than in the pure materials, which form an azeotrope with steam pressure maximum or minimum boiling point. However, the deviations from ideal behavior must be quite large, so actually an azeotrope is formed. Substances that are very similar to how the different alkanes do not form azeotropes can be separated by distillation and clean. Also mixtures of heavy and light water can, over a column with a corresponding number of floors, apart distill despite the small distance between the boiling points. 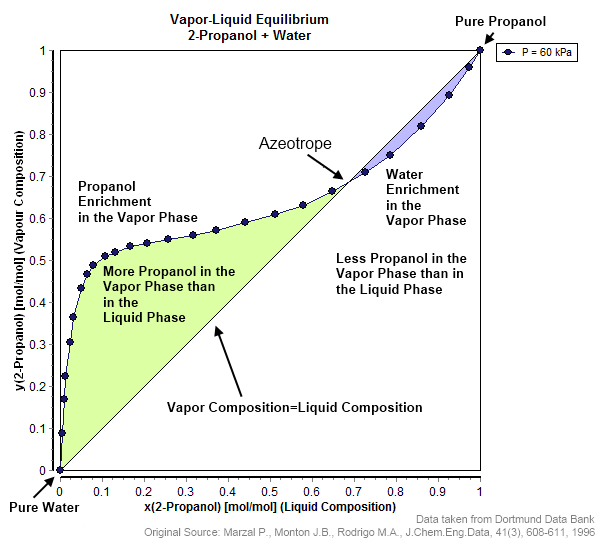 Positive azeotrope corresponds to p, x - diagram of the material mixture at the maximum in the vapor pressure. The boiling point of this mixture has in the T, x - diagram a minimum and is lower than those of the pure substances involved. Examples are the systems ethanol / water and water / 1,4-dioxane. The negative azeotrope corresponds to p, x - diagram of the mixture of materials at the minimum to the vapor pressure. The boiling point of this mixture has in the T, x - diagram of a maximum and higher than those of the pure substances involved. An example of this is the system water / nitric acid. For components that do not fully dissolve in each other, an azeotrope may lie in the miscibility gap. In this case, it is spoken by a heteroazeotrope. In the event that the azeotropic composition is miscible in the area, or the components are miscible in all proportions, is spoken by a homogeneous azeotrope. A heteroazeotrope with the liquid and the steam are not the same composition as the liquid phase at the azeotropic composition is unstable and breaks down into two phases. This property is for example used in the azeotropic rectification to separate an azeotropic mixture by a liquid-liquid phase separator. A Sattelazeotrop only occurs in ternary and higher mixtures. It is characterized by the fact that the ternary (or higher ) azeotrope is between the boiling points of the pure substances and thus neither is a pressure maximum nor a Druckminimumazeotrop. In this system, all binary subsystems azeotropes, acetone / chloroform form a pressure minimum, acetone / methanol and methanol / chloroform Druckmaximumazeotrop. The term " Sattelazeotrop " derives directly from the form of three-dimensional subscribed vapor-liquid equilibrium. Since azeotropic mixtures of components with quite different properties exist (see above), they can usually be easily unravel by other common separation methods other than distillation. Examples include chromatography, addition of suitable molecular sieves or drying agents, such as magnesium sulfate, crystallization of one component at low temperatures. By change of pressure, the composition of the azeotropic mixture in the desired direction can be changed. When multiple distillation of an ethanol - water mixture to obtain an azeotrope of 95.58 % ethanol and 4.42% water, which can not be separated by distillation and boiling at 78.17 ° C.
However, by addition of a third component of the azeotrope can be separated. As an azeotrope with three components, the water-ethanol mixture is formed by the addition of benzene ( a ternary azeotrope ), which boils at 64.9 ° C. Then this water - benzene - ethanol mixture was distilled off, and thus the water may be carried over gradually from the liquid phase. What remains is a benzene - ethanol mixture, from which the benzene can be separated by normal distillation, so as to obtain anhydrous ethanol. Another way to separate an azeotropic ethanol -water mixture, the vapor permeation. In this case, the mixture is evaporated and passed through a membrane unit. The membrane acts as a filter, that is, the pores of which can happen only one component - in this case the water. Driving force for the separation of the mixture is a pressure difference between the interior and the exterior, and the selectivity of the membrane. Thus, the water passes through the membrane (permeate) and the water- free ethanol is on the other side of the membrane (retentate ). As ethanol can be obtained with a purity of up to 99.97 %. In contrast to vapor permeation, the liquid mixture is passed to the membrane in pervaporation. The formation of azeotropes can be used to " herauszuschleppen " a substance from a mixture. For example, commonly used in the chemical reaction technique for the separation of water from a reaction mixture of toluene as entrainer. Toluene reacts with water to a minimum azeotrope. In the condensate, the two liquids separate out again and form two phases. The toluene, the upper phase is fed by a water circulation in the reaction. The water is separated, and from the amount of water formed, the course of the reaction can be observed.